From the Cumberland Gap to the Atlantic Ocean, this is Virginia Water Radio for the week of September 8, 2014. This week, we start with a series of mystery sounds about power, fuel, and a high-placed sphere of influence on water. Have a listen for about 25 seconds, and see if you can guess that sphere. And here’s a hint: you’ll get the answer if you look in the right shed. If you guessed the atmosphere, you’re right! And if you knew that the hint referred to an airshed, rather than the possibly more familar term “watershed,” you might be an expert on the connections between air and water quality. Every water body—just like any place on the earth’s surface—is part of an airshed, the area from which the point receives air-borne materials. Within airsheds, electric-power generation and forms of transportation that burn fossil fuels, are two major sources of air pollutants. Transported possibly hundreds of miles as gases or small particles, some air pollutants can become water pollutants when they reach the earth’s surface through a complicated set of processes called atmospheric deposition. For example, acid rain refers to the deposition of materials that can make water or soils more acidic. Four key kinds of air-borne water pollutants are nitrogen compounds, sulfur dioxide, mercury, and ground-level ozone. Collectively, their impacts include excessive nutrients, acidification, and toxic effects. Another major group of air pollutants are carbon dioxide and other gases implicated in global warming and climate changes. Air pollution is, of course, a major human-health issue. Even so, when you hear NOAA Weather Radio or other sources say that on a given day “the primary pollutants are particles” or “the primary pollutant is ozone,” keep in mind that water bodies, just like human bodies, exist not only in watersheds but also in airsheds. Precipitation collector at the Big Meadows air-quality monitoring site in Shenandoah National Park south of Luray, Va., on the Madison County/Page County border. National Park Service photo, accessed online at http://www.nps.gov/shen/naturescience/mon_air.htm on 9/8/14. Some of the ideas and information for this episode were based on a pending Virginia Water Resources Research Center article by Heather Longo on air pollution and water resources in Virginia. The sounds in the opening of this episode were wind in trees, an electricity-transmission line, automobile, a train, and a jet plane; all recorded in or around Blacksburg, Va., by Virginia Water Radio. The Weather Radio excerpts (last paragraph) were recorded by Virginia Water Radio from NOAA (National Oceanic and Atmospheric Administration) Weather Radio broadcasts from the National Weather Service Forecast Office in Blacksburg, Va., on 9/5/14 (for “particles”) and 9/6/14 (for “ozone”). Atmospheric Ammonia: Sources and Fate/A Review of Ongoing Federal Research and Future Needs, by the Air Quality Research Subcommittee for the National Oceanic and Atmospheric Administration (NOAA) Committee on the Environment and Natural Resources (CENR), available online at http://www.esrl.noaa.gov/csd/AQRS/reports/ammonia.pdf. Nitrogen Pollution: From the Sources to the Sea, by C.T. Driscoll et al., Hubbard Brook Research Foundation, Hanover, N.H., 2003. 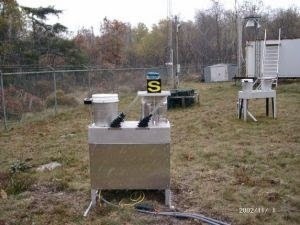 National Atmospheric Deposition Program, http://nadp.sws.uiuc.edu/ and http://nadp.sws.uiuc.edu/amon/. National Park Service (NPS), “Air Quality in National Parks: Trends (2000-2009) and Conditions (2005-2009),” Natural Resource Report NPS/NRSS/ARD/NRR—2013/683, available online at http://www.nature.nps.gov/air/who/npsPerfMeasures.cfm. Appendix B, pages 25-40 (as listed in the document), is a color-coded table listing the trends and conditions in 197 park units (as of 2009) for haze, mercury, nitrogen, ozone, and sulfate. NPS, “Air Quality in Parks,” online at http://www.nature.nps.gov/air/Permits/aris/index.cfm. NPS, “About the Inventory and Monitoring Program,” online at http://science.nature.nps.gov/im/about.cfm. A map showing the 32 monitoring networks is available online at http://science.nature.nps.gov/im/networks.cfm. NPS, “Blue Ridge Parkway/Air Quality,” online at http://www.nps.gov/blri/naturescience/airquality.htm. NPS, “Shenandoah National Park/Air Quality,” online at http://www.nps.gov/shen/naturescience/airquality.htm. NPS, “Shenandoah National Park/Mercury Deposition,” online at http://www.nps.gov/shen/naturescience/mercury_deposition.htm. U.S. Environmental Protection Agency (EPA), “Air Pollutants,” online at http://www.epa.gov/air/airpollutants.html. This page links to many specific topics, categorized by pollutant.U.S. EPA Chesapeake Bay Program, “Air Pollution,” online at http://www.chesapeakebay.net/issues/issue/air_pollution#inline. U.S. EPA, “Chesapeake Bay Glossary,” online at http://ofmpub.epa.gov/sor_internet/registry/termreg/searchandretrieve/glossariesandkeywordlists/search.do?details=&vocabName=Chesapeake%20Bay%20Glossary. U.S. EPA Great Waters Program, “Chesapeake Bay,” online at http://www.epa.gov/oaqps001/gr8water/xbrochure/chesapea.html. U.S. EPA, “Puget Sound/Transboundary Air Quality,” http://www.epa.gov/pugetsound/transboundary/index.html. U.S. Geological Survey (USGS), “Elevated Levels of Mercury Found in Fish in Western U.S. National Parks,” April 16, 2014, news release, online at http://www.usgs.gov/newsroom/article.asp?ID=3869&from=rss#.U_-U3mPuP58. USGS, “Mercury in the Environment,” (Fact Sheet 146-00, October 2000), online at http://www.usgs.gov/themes/factsheet/146-00/. Virginia Department of Environmental Quality, “Air,” online at http://www.deq.virginia.gov/Programs/Air.aspx. For selected news, events, and resources relevant to air-water connections in Virginia, please visit the “Air-Water” category in the Virginia Water Central News Grouper, available online at http://vawatercentralnewsgrouper.wordpress.com/category/air-water/. 9/23/14 added note: In September 2014, Shenandoah National Park officials announced that the park will be part of a nationwide study of mercury levels and effects in national parks. Volunteers will collect immature dragonflies at sampling sites in the park. Source: Residents help in Shenandoah Park mercury study, Staunton [Va.] News-Leader, 9/17/14. Park Service station keeps track of air quality and much more, Fredericksburg Free Lance-Star, 10/22/14. 2/27/15 added note: For a news account on scientists investigating dispersal of air-pollutants in winter, please see Scientists zeroing in on where air pollution goes in winter, Associated Press, as published by Richmond Times-Dispatch, 2/24/15. 3/4/15 added note: For a introduction to the various kinds of alternative sources of automobile fuels being used, developed, or investigated, please Student's Guide to Alternative Fuels, from the Auto Insurance Center, online at http://www.autoinsurancecenter.com/students-guide-to-alternative-fuels.htm. 'Super polluters' tainting Shenandoah Valley air, [Staunton, Va.] News Leader, 9/30/16.